The University Research Park located just east of downtown Oklahoma city is part of the University of Oklahoma Health Sciences Center campus. Modern biomedical research labs and office space occupy the more than 700,000 square foot complex. The objective of this project was to present a design solution to utilize the unoccupied land to the north of the complex in an exciting and innovative manner. 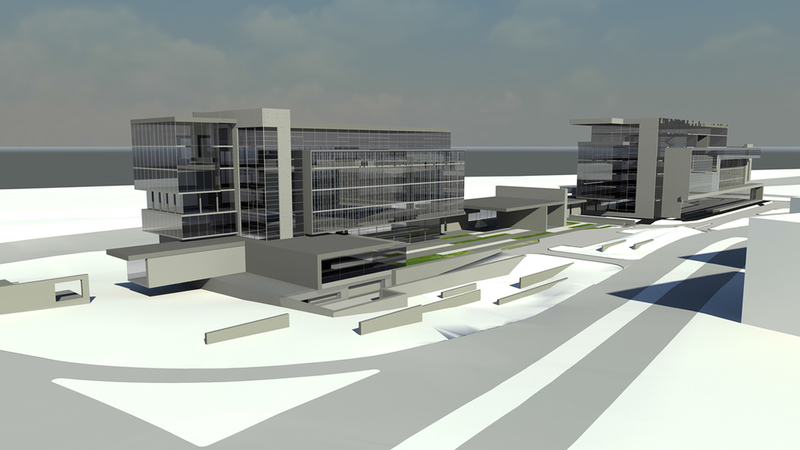 The design needed to facilitate underground parking, a new boulevard, and cutting edge research and office space. The conceptual design expanded on the footprint of the existing buildings within the complex while providing exterior extensions and amazing views of downtown Oklahoma City. A centrally located entry with a common lobby area connects the two flanking buildings while the exterior glass facade undulates in and out to create intimate pockets, shading, and expansive views.